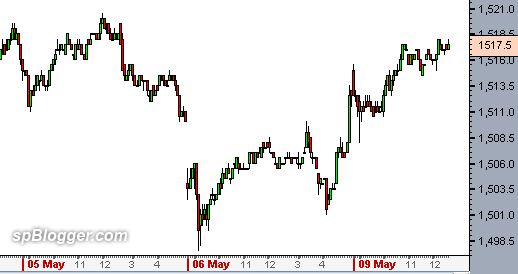 Home Futures Second FKLI trade ~ Lost!!! Second FKLI trade ~ Lost!!! Err… I thought that I don’t need to pay education fee for FKLI. But I was wrong. I am still very young on this futures market. Paid my very first fee ~ RM2710 on it. Lost 10 points on 5 lots. Bought at 1514.5 on 5 May and sold at 1504.5 on 6 May early morning. KLCI dropped to 1507.5 while FKLI dropped to 1497.5. And I forecast KLCI will keep dropping so I have to cut loss. But it end up on the other way around today. Thanks to US stronger than expected jobs report. FKLI is priced almost the same as KLCI right now. No more 10 points discount like previous 2 days. From technical point of view, KLCI is still weak, but might gain if follow other region up trend. Previous articleFirst FKLI trade ~ Gain!! !